My friend, Daniel, has long been part of my various online networks, and his work around youths and poverty and violence prevention have informed many a discussion. My aim is to help communities create and sustain strategies that make more and better non-school tutor/mentor programs available to inner-city youth in high-poverty neighborhoods of Chicago and other cities. I’m Daniel Bassill. I have led volunteer-based tutor/mentor programs in Chicago since 1975. Learn more about me at http://www.tutormentorexchange.net/dan-bassill. Daniel often uses mapping to show how data might inform interventions for young people. I went with a comic to respond to him. This both added another element and also restrained my response. I didn’t want to make a multi-page comic, so my three answers are in the middle. Later, Daniel noted that I had not talked about after-school programs in my comic response, and he is right. While I think those activities are important, I find that the best way to reach the most kids is right in school itself, and I often worry about money and grants allocated for after-school programming take away from needed resources in the schools. I don’t discount the impact after-school programs can have, however. Feel free to add your ideas to the conversation, in any media that helps you make your point. 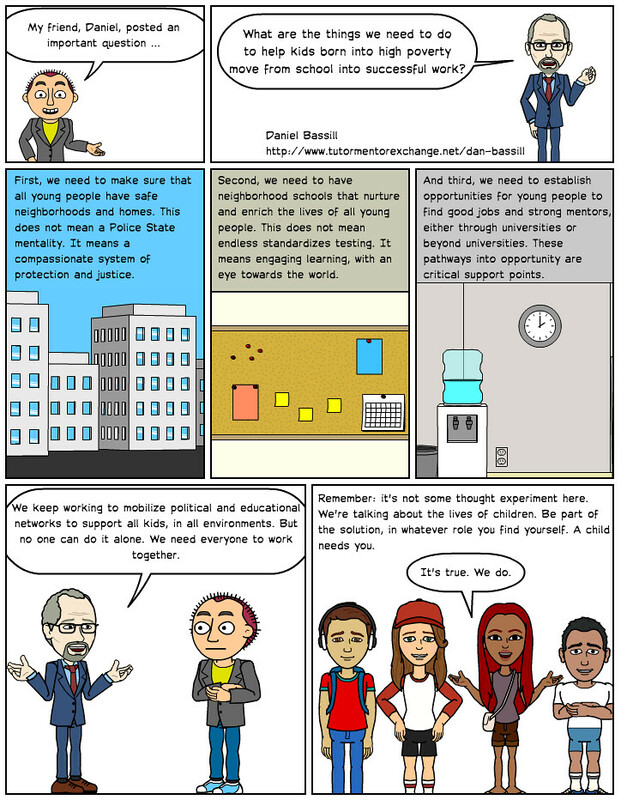 This entry was posted in CLMOOC, comics, Digiwrimo. Bookmark the permalink. Good comic. And all said is true. Yet, there’s a long way to go. I’m currently reading a book “Klimatkriege” (German for Klimat Wars) by Harald Welzer which describes in one chapter how an economy of violence can keep intact for a long time because the ones in power don’t have any interest in ending the violence. He describes this for e.g. Dafur and Somalia. Maybe the same counts for the violence in the poorer areas of US cities? There’s an economy of violence where dealing drugs, stealing/robbing, prostitution, illegal aliens have formed a system where there isn’t enough power to end the violence because the ones running the business have no interest in loosing their business. He also describes how the have-gots have more to fight for (to keep what they’ve got) than the have-nots. So even when there are more have-nots than have-gots, there’s still less cohesion and less social power to fight together to get their equal share. It’s easier apperently to fight for what you have as a group, than to fight for what you don’t have because the cohesion within the have-nots can easily be broken by picking a few of them out of the group and make them part of an intermediate have-a-little-group which gets a small part of the cake as payment for defending the big cake which the have-gots are holding. He refers to the social anthropology of Georg Elwert for all of this. Thank you, Ron. This gives another perspective for me to think about. Have you connected with Daniel at all? I think he would appreciate this insight. I saw your cartoon on the G+ page and did not think to click on your blog to see how you had presented this. I’m glad I waited, which gave Ron a chance to offer his own comment. I’ve not created an annotated version, or a visualization, but someone could. This relates to what Ron wrote about, and is part of that big question I asked. Among “all the things” we need to consider, would be finding ways to bring the masses to the voting booth on a regular basis. I created this concept map- http://tinyurl.com/TMI-Race-Poverty-Map – to illustrate that poverty, inequality, and the learning habits of youth, have many influences..which differ in different places. We need to be digging into articles, using annotation tools as learning aids, and using cMOOCs as idea sharing and relationship building platforms, to understand all of these issues and how they negatively affect people living in areas of concentrated poverty more than people who may be poor, but live in more economically diverse areas, or who may not be poor at all and live far removed from the lives and concerns of people in poverty. There is so much information that the only way to engage in great depth is to make this part of the learning process as young people go through traditional k-12 and higher education, which offers up to 12-16 continuous years of learning that youth could go through BEFORE they enter the adult world and the rest of t heir lives. Opening this up to thousand of other stakeholder offers the possibility that someone will find a way to make it easier for more people to understand and engage in what I’m describing..and that others will dedicate the next 20 to 40 years of their own lives to finding solutions. The result could be a future generation of leaders and voters with a much deeper understanding of complex problems and complex solutions. Thanks for your work on this. Ron I look forward to interacting with you. Happy Holidays.